This is my fifth volunteer trip. Of those five, only twice did I actually do the job for which I applied. It’s funny how that works, but it’s yet another instance in which you must ‘go with the flow.’ Well this time, the ‘flow’ took me away from the orphanage to which I applied and toward a government-subsidized school for the disabled. But that isn’t the challenging part. After all, I enjoy working with people and the time I spent last year working with disabled orphans in Vietnam prepared me for this. And although I tend to shy away from volunteering at organizations when there’s so much as a *sniff* of government about, that isn’t the challenging part, either. I look at it this way: it’s not an actual government facility and I’ve worked in organizations that were in tremendous need of government support and never received it, so I’m happy to know that the Ecuadorian government subsidizes such things. I will gladly support it as long as the facility is clean, well run, and clearly cares for those who are in their charge, and this facility is all of those things. From what I can tell, the only thing it’s lacking is other volunteers. And that, mi amigos, finally brings us to the challenging part. It has been my experience that when you volunteer with organizations that specialize in placing foreigners, you stay with other international volunteers and have access to a volunteer coordinator who can answer your questions. When the coordinator isn’t available (which is often), the other volunteers help you learn the ins-and-outs of the placement. This time around, although I do have the coordinator, I don’t have the other volunteers. I am staying at the home of a lovely family that lives about three miles from the school. This family regularly takes in volunteers for the organization and has separate quarters that can house several more of us, but for whatever reason (low season, scheduling, whatever), I am the only one here. And to make this even more challenging, with the exception of the volunteer coordinator (with whom I have limited contact, mind you), no one—not one member of the family, nor una persona at the school—speaks English. And my Spanish is oh-so-rusty. In fact, I haven’t practiced the language since I volunteered in Peru five years ago, and even then my job was to teach English, so I didn’t practice as much as I would’ve liked. Don’t get me wrong. It’s not as though I expect the people who live and work here to know my language (I’m in their country, after all), it’s just that normally the language barrier is mitigated by other volunteers who are fair to fluent in English. So far, with my limited Espanol, I’ve gathered this much: the school where I am volunteering is called El Fundacion de Ayudamos a Vivir (literally translated, it means the “Help them to live” foundation) and has about thirty students whose families bus them there each day to receive specialized care that includes some schooling, but also includes cognitive and physical therapy. The school’s staff includes a psychologist and several physical therapists and aides. 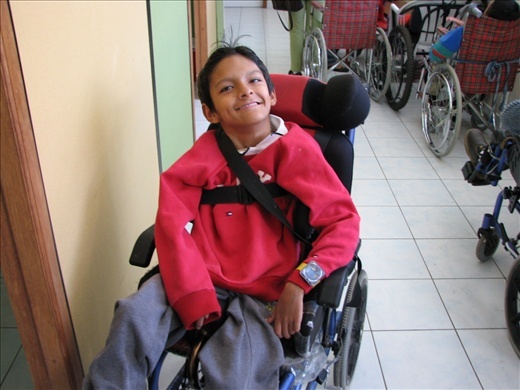 The students themselves range in ages from 7 to 24 years and suffer from a variety of disabilites, including cerebral palsy, muscular dystrophy, Down’s Syndrome, and mental retardation. Some students are highly functional physically, but not mentally, such as the new boy that arrived today who refused to divulge his name, no matter how hard the psychologist or I tried to coax it from him. Others are highly functional mentally, but not physically, such as Vanessa, who suffers from muscular dystrophy and can’t control her body, but who understands every word you say to her.